Home › FAQ › Live Certificate › How does Live Certificate work? 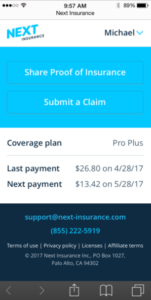 When you login to your account at the Next Insurance website, you’ll see an option to “Share Proof”. Clicking that will give you an option to either put in an email address and have us send your certificate, or copy a link which you can send to anyone you like that will take them to your Live Certificate.